“I have an iPhone that is synced with my PC, but I also use a MacBook Pro. – Ability to find your iTunes folder: in Windows XP, its default location is in “My Music” and, for both Windows Vista and Mac OS, it is located in “Music”. – Knowledge of how to open a file with a desired application on both Windows and Mac (however, you do not need to if using Mac to Mac). – Make sure iTunes is CLOSED! – Backup the iTunes Library on the machine with which you wish to sync. Backup “iTunes Music Library.xml” and “iTunes Music Library” (or iTunes Music Library.itl on Windows). It is important that you back these files up to a safe location because we will be modifying the files. – Retrieve your iTunes Library ID. 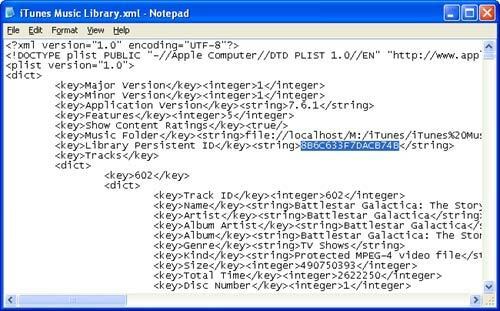 Open “iTunes Music Library.xml” with a text editor (TextEdit on Macs, Notepad on Windows). Find the entry after <string></string> tags, after “Library Persistent ID”. In the screenshot 8B6C633F7DACB74B is my iTunes Library ID. Copy this entry exactly to a piece of paper or email this to yourself. After you have stored the iTunes Library ID you may close the file. – Retrieve your iTunes Library ID. Open “iTunes Music Library.xml” with a text editor (TextEdit on Macs, Notepad on Windows). Find the entry after <string></string> tags, after “Library Persistent ID”. In the screenshot 0E958526D15C67FAis my iTunes Library ID. Copy this entry exactly to a piece of paper or email this to yourself. Do NOT close the file yet! – Replace the the iTunes Library ID, in my case 0E958526D15C67FA with the one from the computer (8B6C633F7DACB74B-iTunes Library ID from the Windows machine) the iPhone is already syncing with. Save the file, then close it. – Choose “Find and Replace” from the Edit menu. 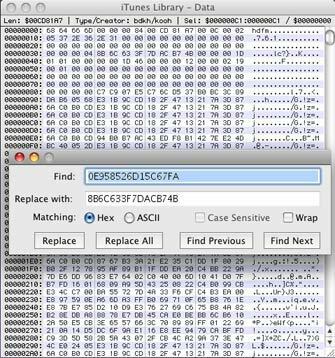 Make sure the “Hex” matching is selected not ASCII. Find the iTunes Library IDs you found from both the primary and secondary computers. – In the “Find” section, enter the iTunes Library ID of the secondary computer and, in the “Replace” section, enter the iTunes Library ID from the primary computer. There should be one match. Save the file and close. You should now be able to sync your devices with two or more computers. Now, you will not be alerted by the annoying “Erase Your Data” prompt from iTunes. If you have any questions or comments please leave them here. Tell us about your experience! This doesn’t work with iTunes 10. Anyone a workaround? I have followed all the steps exactly but it is still not letting me sync on my 2nd PC. My second PC is iTunes 10 and my first PC is iTunes 9. Will be the reason? So I followed these instructions, edit the files, and save them but it doesn’t work. I saved the file, closed them and reopened them to verify the edit was still the same (it was),and still when I plug the cord into my iphone and try to sync any music or apps, itunes tells me that I will have to erase everything on my phone. I’ve tried this 4 or 5 times and was meticulous about following the instructions each time. Did a recent itunes update remove this exploit? What if the first PC the phone was synced with had a hard drive failure and is nolonger accessable. How can I get the phone to move to a new computer? I dont really want to loose all the music i have on my Phone. You may have read something incorrectly. This does work on Apple’s latest iTunes 10. The best thing to do is copy the iTunes Music Library file from one machine to the other, so long as it belongs to you. 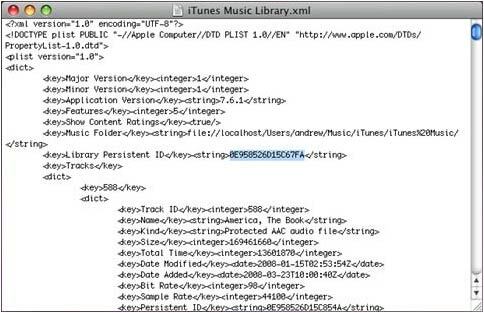 The iTunes Music Library.xml file has the data iTunes checks. Is it from a Mac to PC or PC to PC, etc. ? I just tried the same procedure above and it is not working… I have Windows 7 and is running iTunes version 10. I have done this before with a older PC running XP and iTunes version 9 and it worked. Noticed there are some new codes \Playlist Persistent ID\ in the \itunes Music Library.xml\ file that was not present in the old file… is this the reason? Hi, what about the iTunes media? I tried the steps and it seems working because iTunes didn’t asked to erase my data. Next thing, I copy and paste my iTunes media folder from primary to secondary computer but still, all the apps do not appear in the new iTunes, if I start sync it will make my iPhone blank. You should be fine; backup in case, we are not responsible for any lost media on any devices. To have the media show up, drag and drop into iTunes, or double click them and it should open them in iTunes. I have multiple machines running iTunes 10 both Windows 7 and OS X. I would suggest updating both to iTunes 10, keep them both on the same page. If it is configured correctly, the versions should not matter. The device is registered to a certain Persistent ID that triggers the prompt. Thanks a lot! I can sync my apps now. Hi I had the same problem as @Mike. Everytime I change the Library ID in iTunes Library.itl file, it reverts back to the old Library ID when I open iTunes. My primary com is Mac and the secondary is PC. I’ve tried to do this sereval times and all of the steps work up until I get to having to find the iTunes Library ID in the hexedit. Followed the steps outlined above and still get the unwanted message. I have an iPhone 4 with the latest software and a MacBook Pro with the latest version of OS X. Anything I should check for? Keep both at the same version. Update the first PC to iTunes 10. Try and copy the directory files just like Maxima308 did. But this isn’t exactly ‘syncing’ as you have to manually manage music. iPhone or any apple kit won’t let you sync down to the device from one PC and up to another PC ie no 2 way syncing. Or have I got it wrong? It is possible by modifying the Persistent ID. This allows to have the device think that it is connected to the “main computer” and operates the sync process correctly. Hi. I followed all the steps above & when I attach my iPhone to my 2nd computer, it won’t allow to select “manually manage music and videos” w/out the warning popup that asks me if I want to erase this iPHone and sync with the new iTunes library. I have an iPhone 4 that is up to date and a MacBook & an iMac also up to date (10.6.7). Any idea what could be going on? Do these directions still work with all new devices/operating softwares? In order to sync with different computers, you have to modify the library file as see in the article above. These file is used as an “ID” to check and see that it is your original computer. This allows iTunes and your iPhone to act like they are syncing with the original computer. Once you make the modifications, there will no longer be the error. I got it to work, but when I want to sync music or photos (or anything else) from the 2nd machine, iTunes wants to erase the same existing media type from the iPhone.